"Social Studies for kids" is a web portal is a collection of resources for social studies aimed at students and teachers. It includes a section called "this week in history. It presents an important event that happened sometimes in the past during the same week as we are. The site is geared toward social studies in the US, so there is a section about US government. The articles are presented in a language quite simple for elementary and secondary school students. It also includes information about US history and geography. In addition to the US, world geography and history are also covered. 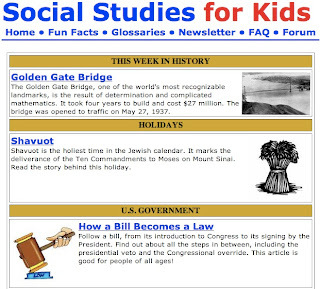 Some of the subjects link to other websites while some of the subjects are covered directly on www.socialstudiesforkids.com. There is a section with fun facts such as the fact we read from left to right for no specific reason and the fact that Galileo didn't really invent the telescope. The glossary is also well designed based on historical events rather than being solely alphabetical. There is also a discussion forum for teachers and students who want to chat about geography and history.